At Adventures in Erylia, we do not just create a podcast, many of us are very avid listeners to a variety of other podcasts. You can browse through this collection to find shows that at least one member of the cast has listened to, endorses, and recommends. When possible, a promo for the show has been included with their page to get an idea of their content. Give them a try, let them know we sent you their way. If you have an idea what kind of show you are looking for, browse the list below and be taken right to a shows feature page. Summary - When you take the sessions from an actual play podcast and mash them together with an audio drama, you get something like Hail and Well Met’s Guild of Adventurers. This is actually a show that found me. One of their players saw this page and reached out to me about what it takes to get added. Their timing was impeccable because I was just about to start adding a new round of podcasts to my queue. I decided to give this show a try and it quickly overrode my queue of backlog content to get caught up on. The production value and editing is on point and if it weren’t for still leaving dice rolls in, you might not even believe they are playing D&D instead of just telling a story together. The one downside I have found to this show since being caught up is that now I have to wait a month in between episodes. The story follows three people who all have been invited to join up with the Guild of Adventurers, which appears to be teetering on the edge of shutting down due to lack of new adventurers joining. They are quickly brought in and put to work, which helps show how little use the guild hall has seen in recent times. There are some great moments early on in the story and without giving away too much, one that sticks out in my mind was a dance off. During their first story arc, the campaign loosely follows a story similar to Romeo and Juliet, but has since moved onto what appears to be its own story. I love the way this group plays off of one another. They have great moments of humor and silliness mixed in with more serious story telling. Summary - The Glass Cannon Podcast is a Pathfinder based actual play, that is running the adventure path, Giant Slayer. They are now the official Pathfinder Podcast, recognized by Paizo, Inc. These guys are truly building themselves up to be one of the most successful actual play podcasts out there, and they deserve it. They are now doing multiple shows, which include two weekly actual plays and extra bonus content for their patrons. 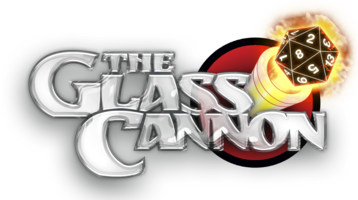 The Glass Cannon is a crew that is going the distance, able to secure great guest interviews and hosting multiple live shows and fan meet ups. We have had the pleasure of meeting up with them for their first two years at Paizocon in Seattle and would highly recommend it to anyone who is in the area or able to be in the area.. The show that these guys are creating with Giant Slayer is top notch. Their audio is amazing and they do a great job of running Syrinscape while they play to set the mood not only for them, but for us as listeners as well. They have great chemistry together that comes from years as friends playing games together and the shows that they create make it easy to feel like you are just another person at the table with them. Even if you are familiar with the story of the Giant Slayer adventure path, it is worth checking out this show not only to experience some top notch roleplay, but Troy has done a lot to add to the story outside of what is written in the books. Summary - Break Room at the Cineplex is a show where 3 friends, Kyle Greg & Henry, gather each week to review and rate a movie. They also give us a peak into life in small town Timberdale including bizarre things like men living in the ceiling, a not-so-secret secret fight club, and a literary black market. An improv comedy show which exemplifies "yes, and..." In the most ridiculous way while managing to maintain underlying continuities from week to week. Summary - Though the name might imply this is daily show, it is not. The Daily Tavern is a semi-weekly radio show set in the fictional Shatterpoint City. In each episode, Arthur, our radio host, broadcasts about news and various events going on within the city. I have no idea how Arthur manages to keep up with all of the stories and other news pieces for the goings on in the city, but he does. Every time that my handheld glowing rock lights up with a new broadcast from the tower, I know I am in for some entertainment, as well as the news. This is a great show if you’re looking for some short form fantasy audio entertainment. At it’s core, The Daily Tavern is a storytelling podcast, but one unlike any other I have listened to. Instead of telling an epic fantasy or sci-fi story, The Daily Tavern tells the story of Shatterpoint City from the perspective of a radio news host. Learn about events taking place in the city, the city’s history, and hear stories from denizens of the city. Summary - Redemption takes you away from the usual fantasy stories that we recommend and into space in the Star Wars universe. The story that Redemption tells starts a little bit before The Clone Wars in the canon of the universe with the crew of the Krallet’s Fang, an heirloom ship to one of the players. The crew find themselves getting wrapped up in the early events of The Clone Wars, possibly getting themselves far more wrapped up into an intergalactic conflict many of them would rather avoid. The are so many reasons I have come to love this show, the biggest of which is it’s focus on a much smaller scale than what we are used to with Star Wars from the movies. Even though the crew finds themselves adjacent to the events of The Clone Wars, they have yet to become large players in that massive war and story and remain mostly on the outskirts, occasionally brushing up against the major plot. Going along with the feel of the story, the players knowledge, as well as some of the effects used, make this story feel right at home in the Star Wars universe. The Edge of the Empire system that Redemption uses is a very interesting and different system if you are used to D20 based systems such as D&D and Pathfinder. The players roll various different colored dice granted to them by their skill level, versus a number of dice for the difficulty of the check. Instead of trying to get over or under a certain number like D20 systems use, the dice are broken up into success/failure and advantage/threats and are added against each other when rolled. The system is much more focused on improv story telling than relying on strict rules to determine the flow of the game. Summary - Four Orbs is a great podcast ran by a great guy who I have had the pleasure of talking to extensively about podcasting, running a campaign, and building a world. Aesis, the world that the campaign for Four Orbs takes place in, is something the DM has been working on and building for many years. This world features some of the most unique and different creatures and enemies I have seen since I started listening to actual play podcasts, there are so many creatures that the players encounter that I don’t recognize from the monster manual. Whether Dave is just re-flavoring stat blocks from the book or creating these creatures from scratch, I very much admire his creativity and dedication to the craft. Dave also creates the music that they use in their show and is also responsible for creating the music that was used in our own podcasts promo. The story that Four Orbs tells has everything you could want from listening to a story told through the lens of an RPG. The players have mostly been focused on one continent so far, but they have traveled all over it, seeing many different locations and experiencing a few cultures, including Bullywugs. The group has a great chemistry, filled with humor mostly led on by their bard. They spend time going through dungeons, solving mysteries, visiting the big city, and exploring a new and lost land. They have also made it easy to catch up to the story if you aren’t ready or able to commit to a long story arc. Summary - Inter-party Conflict is a tabletop gaming question and answer podcast. They answer your questions so you can have the best gaming experience possible. Gabe and Jeff are a great pair with superb chemistry. When they get on the mics, you get the feeling they could talk tabletop gaming literally all day. One of the best things about their show is that while they have years of gaming experiences to talk about, the focus of the show is on questions taken from their listeners and various tabletop communities online. While listening, you will not only be hearing stories from these guys games, but you will be getting tips, tricks, and advice for how to handle numerous tabletop gaming situations. You can also take some inspiration from their segment, The Dragon’s Hoard, where they will take magic item suggestions that they like or that their community tells them about and discuss it’s various properties. This is a great way to learn about items you may have never even heard of before, including some homebrew creations. Summary - Androids & Aliens is the second flagship podcast brought to us by the Glass Cannon Network. Like their Pathfinder counterpart, The Glass Cannon Podcast, Androids & Aliens is following an adventure path, Dead Suns, which is the first adventure path released for the Starfinder system. This show brings us the same cast and crew that plays on The Glass Cannon Podcast, with an additional player, Elli. As the name may imply, Androids & Aliens is not set in our usual medieval fantasy worlds, instead the Starfinder system is set far into the future and is much more a Science Fantasy story. For the story and gameplay of Androids and Aliens, we can take everything we know and love from The Glass Cannon Podcast and amplify it. The crew clearly put a lot of time into getting things ready to go before they ever started recording because once the mics we on, the story was on point and as amazing as we can expect from these guys and gal. Join the crew as they enter the ranks of the Starfinder Society and are immediately thrown into turmoil and sent on their first mission to investigate a rock to settle a dispute. Summary - Dungeons and Randomness is the largest and most connected actual play “network” that I know of. I call them a network, because even though it is all the same dungeon master, set in the same world, all within the same timeline, D&R has a cast of nearly 20 players split across 3 different groups. The work that Jason does to keep everything organized and keep the timeline and story consistent across all of these groups is amazing. Dungeons and Randomness is now on it’s second arc. The first arc was played using the 4th edition ruleset and lasted for their first 200 episodes before ending in an exciting and epic conclusion. If 200 episodes is a bit too much of a commitment to start out, they have a recap episode that goes over the major events that occurred, or you can jump right into their second arc. For Arc 2, the group has moved over to the 5th edition ruleset and jumped forward in time a little bit where some players reprise their original characters, while other decide to bring in a new character for the story. Jason and all of D&R is a huge inspiration for me and the world of Erylia. It was while listening to D&R that I decided to begin work on my own world and take on the mantle of Dungeon Master. How much I enjoy listening to the show and craving more of the story is also what had given me the idea to turn my gaming session into a podcast for all of you to listen to. Summary - Ballad of the Seven Dice has got to have one of the most interesting openings and premises I have heard from a D&D campaign so far. The story kicks off with individual player introduction episodes for each of the characters, and each one comes from their own, unique plane of existence. One of the biggest stand outs to me, due to this being a D&D campaign, is that the bard is actually from a plane set in a most post-future or somewhat cyberpunk setting. The story itself is set in the Forgotten Realms, which is the main cannon setting for 5th Edition, though the main focus of the story is on the homebrew city of Sanctuary. This is a show with a very different story and may be better suited for an older audience. There is a bit of a horror lean to it and some of the events and effects used are not for those who are grossed out easily. The characters find themselves all pulled from their own home planes into the Forgotten Realms and must work together to fight against a powerful, seemingly extraplanar being. The characters are not alone however, there are many groups who, like them, have been pulled together to work as a group and fight back against this consuming evil. At the time of writing this, the group is fairly new to the city of Sanctuary, where all of these groups are working from, so they haven’t been able to interact with the predecessors much, but I have a feeling this story is going to unfold into quite the tale. Summary - Dice Tribe is a family-friendly exciting adventure that takes place in an area of the Forgotten Realms called Chult. There you will find dangerous jungles, islands, volcanoes, rugged peaks, and even dinosaurs! It’s like one of those movies you can watch over and over...it’s so fun!!! The first 2 episodes let you get to know the 5 characters and what they are up to when the story begins. I’d like to tell you about each of them. But they are so unique, exciting, mysterious, and exotic that I want to keep it as a treasure for you to discover yourself. I seriously can’t get enough of this podcast. I could totally see it as a fun animated series or even comic book. The story and character development is just truly that amazing. I actually stumbled across Dice Tribe because they are part of the Encounter Roleplay umbrella of D&D audio dramas. What I just love about Dice Tribe is that they have incredible creative role playing skills, to help tell the story and develop their characters, but being able to hear their dice rolls really make me feel like I’m at the table with them during each episode. Most of the players have played the game for quite awhile and really bring the story to life with their animated voices and colorful acting skills. The DM, Mark Slack, has been playing D&D since he was a kid and just really knows how to tell a story and help his players shine. The podcast itself is just wonderfully produced. Summary - Godsfall is a great mix between a regular D&D actual play and an audio drama. The episodes are highly edited and produced with a wonderful use of music, ambience, and foley work. Godsfall has some very interesting concepts behind it. In the world of Khalgun, gods and demi-gods are very real things. Aram has created and released a world book that not only covers the lands and peoples of Khalgun, but also the gods and how you can incorporate them into your own world. The cast is fairly large and diverse with the focus of the story shifting between different and changing groups of characters who have all begun to find themselves awaking as embodiments of the gods. This changing perspective helps make the world feel very alive, especially as different groups visit vastly different areas of the world. This is a great show to listen to if you are wanting a story told where random chance plays a part in the outcome, but find yourself struggling with a lot of the “at the table” feeling of many other actual plays. Summary - Fear the Boot is essentially one of the old guard in the podcast community, especially in the tabletop gaming niche. Their podcast catalog goes back 12 years and they have released over 500 regular episodes of their show. For the most part, they are a round table discussion type podcast with a focus on roleplaying games. Some of the hosts have changed over time, usually because peoples lives have changed in the past 12 years, but they’ve always maintained a positive feel to the show. This was actually one of the first podcasts I discovered, years ago, and have stuck with it ever since. The backlog is huge, but you can jump in anywhere. The guys, and occasional girls, of the show have been gaming for decades and will hop on the mics whenever a topic comes up between them that they feel they can talk about at length. Subtly and over time, this show can teach you a lot of the do’s and don’t’s of being part of a role playing group. The show has also spun off into an actual play series, which has given them countless more topics to talk about now that they have topics to pull from directly related to games where the audience can get context for the “you had to be there” stories and discussions. Better Podcasting is the first podcast I started listening to after starting Adventures in Erylia. Honestly, I wish I had known about them and started listening to them sooner. Listening to them, and talking with Stephen and Stargate Pioneer on Twitter and Reddit was a lot of the inspiration behind the decision to buy better gear and ultimately relaunch AinE. I’ve only just recently begun to listen to The Audacity to Podcast. I was drawn to it for a few reasons. First, I got caught up with Better Podcasting and wanted to continue expanding my knowledge of podcasting. Also, Daniel J Lewis goes over a lot of tips and tricks when it comes to using Audacity, which is the software that I use for editing. Lastly, Daniel is a very well known and well respected member of the podcasting community, and I recognized his name even before I started listening to his podcast. Good Morning Theria is a spin-off show from Dungeons and Randomness. Jason and his co-host Bri talk about things that are going on in their lives, things that are going on in nerd culture, and read and respond to their listener emails. Summary - Lawful Stupid is a podcast featuring four friends, 3 players with one dungeon master, who play a game with a great balance of humor and seriousness. Though the show started with humble beginnings and a small scale campaign, the 3 players find themselves leaving their small village and heading to the big city. As time has gone on, the events that these characters have found themselves tied to have only grown in size, nearing conflicts that could alter the course of the entire world. You can tell these guys have a great time playing and are eager to play more. Though in the beginning I thought this was going to be a more comedic take on a D&D game, things have shifted to a more serious and epic plot. However, the jokes made in the beginning do still come up and the boys know how to lighten the mood with a well timed quip.